Maths anxiety: don’t let the panic get you! Are you afraid of maths? Does it make you uncomfortable or easily confused? This is extremely common. Maths panic or maths anxiety may be the result of beliefs that maths is difficult and can only be mastered by ‘clever’ people. It is this belief which people pick up from an early age that can lead to life-long anxiety whenever we try to multiply or divide numbers. What is 72 divided by 9? We ought to have learnt our times tables in school… But many of us simply freeze when we are faced with such calculations, and we end up reaching for our phones to work it out. What seems to underlie this problem is not that we ‘can’t do maths’, but that we fear it. It is a fear that goes back so far into our childhood – think of the stress you felt due to class tests at a young age, and then exams as a teenager. We thus first need to confront that fear and anxiety before we can hope to gain a better mastery of arithmetic. In training sessions with adults, one of my trainers at ICHAF tells learners, ‘Don’t let the maths panic get you.’ What does she mean? When faced with maths-related questions, we panic before we get a chance to learn the steps to solve them. ‘Everything we do in maths has a logical basis. You just need to learn the steps to follow to reach the answer,’ she says. If we can try to hold our anxiety at bay or suspend it for as long as possible, and then begin the steps required, arithmetic becomes much less stressful, and we can begin to master it. It is now widely recognised that EQ – emotional intelligence – is more important than IQ. This makes sense in terms of maths. We first need the emotional discipline, not to understand maths initially, but to gain control over our own emotions: our fear and anxiety about maths. Once we do that, we can develop the clarity of mind required to focus on and work with numbers. Without the unnecessary baggage of anxiety, maths becomes so much easier. In fact, maths is a lot of fun, and it’s very rewarding. Many great careers and hobbies require a good foundation in maths. What if someone’s difficulty with maths is more serious than a short-term panic, however? Have you heard of dyscalculia? It is a type of learning disability that entails serious difficulty working with numbers and arithmetic. 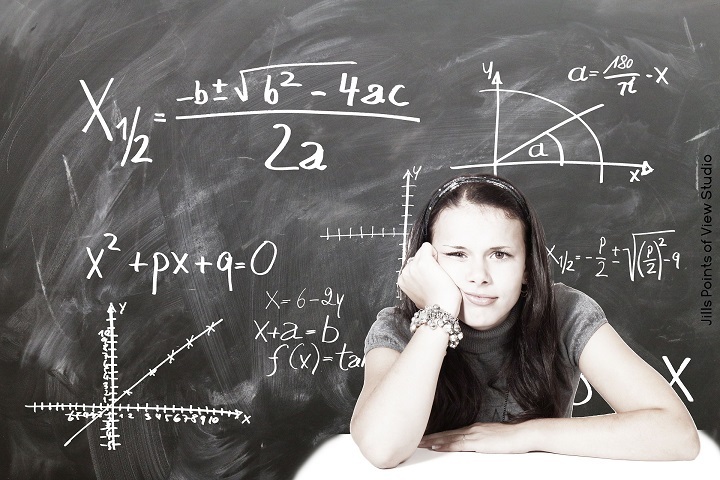 People with dyscalculia may struggle with number-related concepts and relationships. Using the various formulae, symbols and functions in mathematics proves to be a serious challenge for them. A person with dyscalculia may swap numbers around or struggle to translate numbers in digits into words, and vice versa. Even quantities, measurements and relative size can be challenging. For example, they may not understand how 100cm can be equal to 1m and to 0.001km. Something common among those with maths anxiety and dyscalculia is the difficulty in holding numbers in working memory and then following steps to solve a problem. Many of us easily get confused and give up. When someone manages to work something out in their head, we may be truly amazed and think they have some exceptional, almost magical ability. What they have managed to do is focus on the numbers and block out other concerns long enough to figure out the problem. There’s also nothing wrong with using pen and paper to work problems out. It’s important, nevertheless, to understand that it is not that people with maths anxiety or dyscalculia can’t do arithmetic. They need time, patience and practice. Trying to do maths under pressure is what makes it impossible. In the end, it’s up to us not to hold ourselves back in maths development. Despite disabilities such as dyscalculia, or with the more common maths-related anxiety, arithmetic skills can still be learnt. The ICHAF Training Institute is a Seta-approved training and development company. ICHAF offers NQF levels training in business, computer skills training, and soft skills development, among other programmes.